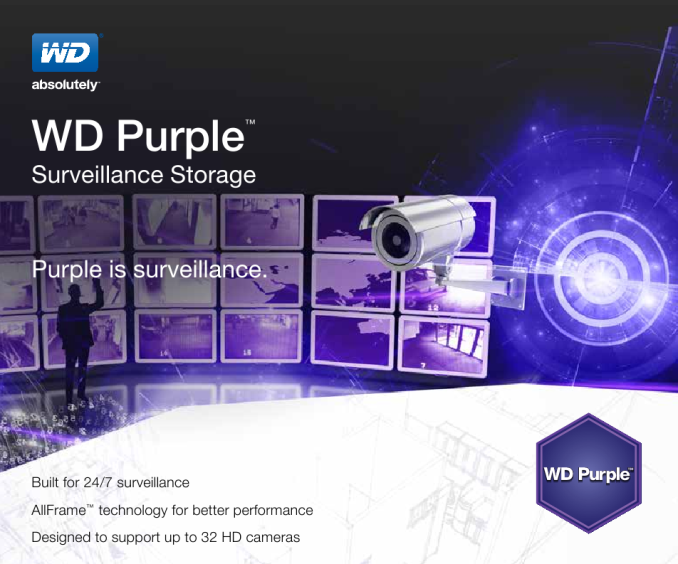 Western Digital’s WD Purple aims to capture the surveillance market where IP cameras produce a great amount of data. WD launched its color-branding strategy with the Red drive line built for the SMB/SOHO NAS market while the Black drives targetted enthusiast. WD Purple expands branding campaign by offering drive capacities of between 1 and 4 terabytes. A single bay can hold up to 8 drives serving up to 32 HD streams. Originally Western Digital’s WD AV-GP covered the surveillance market along with DVR’s and PVR’s. This offered capacities of between 320GB and 3TB, supported up to 12 simultaneous HD streams and could operate 24×7. Similar to AV-GP, the Purple devices are built for 24×7 operations and consist a firmware update on hardware for video support utilizing hardware from the Red line. Workload for the Purple line is rated at 60TB/yr. Drives are covered by a 3-year limited warranty.